Garlic is an ingredient that is used in many of the dishes and garlic oil is very useful in curing and preventing various health problems. Garlic makes the dishes tastier and healthier. Garlic oil is manufactured by two methods – By steam distillation of fresh crushed garlic and also by soaking chopped garlic in vegetable oil. Garlic oil made by steam distillation is more concentrated and pure and it also more expensive. The oil made by the second method on the other hand is milder and less concentrated. You also get garlic oil in the capsule form. This contains 1% garlic oil and the rest of it consists of vegetable oil. Garlic oil contains allicin, which has antibacterial and antioxidant properties and has lots of benefits. Garlic oil makes you healthy from within as well as from outside. External application of garlic oil helps in the treatment of skin infections and pimples. Mix garlic oil with mud pack and use this as a face mask to remove acnes and pimples. The antioxidants present in garlic oil kills the bacteria that cause acne and pimples and helps in providing you a clear and blemish free skin. Garlic oil is very useful for making the immune system strong and in the prevention of cancer cells from spreading. It is also beneficial in removing toxic substances like lead and mercury from the body. Garlic oil is good for your skin also. Apply garlic oil on your skin and it can treat various fungal infections like ringworm, jock itch and athlete’s foot. It is also beneficial for the treatment of warts and corns. The anti-inflammatory properties of garlic oil provide you relief from psoriasis and provide a soothing effect to your skin. You can get relief from itchy athlete’s foot by dipping your feet in a bowl of warm water to which a few drops of garlic oil is added. Most of the people suffer from dandruff at some stages of their life. Garlic oil is good for the treatment of dandruff. You can take garlic oil or garlic oil capsules and apply the oil on your scalp and hair. It acts on flakes and dandruff, and also soothes itchy scalp. It keeps the scalp hydrated and helps in preventing dandruff from appearing again. You may apply garlic oil every alternate week and continue using it until all the dandruff is removed. Garlic oil contains a lot of nutrients that are good for your hair. It increases the hair growth and also improves the texture of your hair. Many diseases of the scalp can also be prevented by using garlic oil. This is because garlic oil is rich in sulfur, Vitamin C, Vitamin E, Vitamin B1 and Vitamin B6, all of which are essential for healthy and strong hair and the scalp. It is also good for making the roots of the hair strong and for preventing breaking of the hair strands. Despite its pungent smell, garlic oil works wonders for your hair. Apply garlic oil on your hair and scalp and massage well with your hands. Leave it overnight and then wash off with a mild shampoo next morning. This increases the hair growth and increases blood circulation, making the roots of the hair strong. It also removes toxic substances form the scalp and makes the scalp healthy. Garlic oil is useful for getting relief from body pains and aches. Many of the sports people take garlic oil capsules for treating muscle spasms in the body. Garlic oil can reduce the level of total cholesterol in your body as well as LDL, the bad cholesterol. Taking garlic oil can reduce cholesterol by 10% to 15%. The chemical called allyl sulfur contained in garlic oil is beneficial in curing as well as preventing the development of cancer cells. Some of the cancers that it can prevent are esophageal cancer, pancreatic cancer, breast cancer, stomach cancer, prostate cancer, colon cancer and so on. so include garlic oil in your diet to avoid cancer. Infection of the ear is caused by viruses and you suffer from pain and irritation as well as great discomfort. 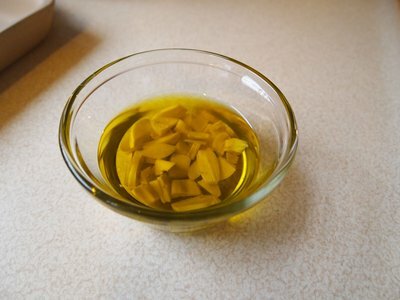 By using warm homemade garlic oil you can easily cure ear infections. Garlic oil is well known for its antiviral, antibacterial and antiseptic properties and has great medicinal value. To treat ear infections with garlic oil, take a few drops of garlic oil and 2 tablespoons of either olive, coconut or mustard oil. Warm the oils on a low flame and keep them in a glass bottle. You can keep it in the refrigerator for up to 5 days. Put 2 or 3 drops of the oil in the ear and you will get relief from pain. Garlic oil also cures common cold and sinusitis. High blood pressure is one of the main reasons for causing cardiovascular diseases like strokes and heart attacks. Garlic oil has active compounds that help in lowering high blood pressure. It is able to make blood thinner and unclog the blood vessels, thus preventing antherosclerosis. Garlic oil is also good for lowering the level of blood sugar and in the treatment of diabetes. The antifungal and antibacterial properties of garlic oil make it excellent for the treatment of infections caused by fungi and bacteria. It also has a lot of other medicinal properties. Garlic oil is used in staph infections and yeast infections as well. If you are suffering from tooth ache, you can get relief by using garlic oil. Take the oil in a small cotton ball and put it on the affected tooth. Let it stay for 10 to 30 minutes. Repeat it for 3 to 4 times a day. This will get you relief from pain.